Ya'll know I had a ladies Valentine's Day brunch. It was good. It was fun. We got creative. It was nothing compared to the Design*Sponge crafting brunch I went to last week! The tables were set with a crazy amount of Valentine's Day crafting tools. We even got goody bags (with our names types on them with a vintage typewriter)!!! Ok, Grace, I love you, I don't have to say it again, lets move on to the crafts! 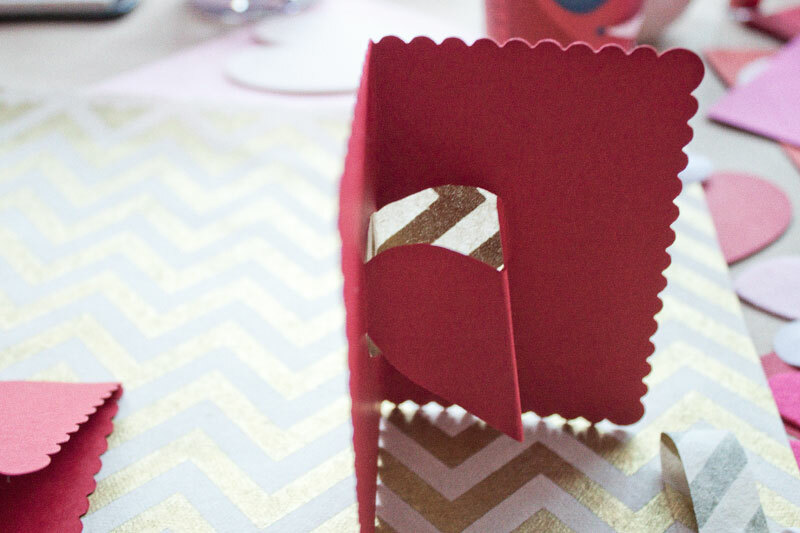 The team showed us some cute crafts to have in our arsenal, lets start with a super easy Heart Pop Up Card. I took mine to the next level, so you will need 3 pieces of paper, but this can certainly be done with 2. Gather 2 pieces of paper, the same size, and fold them down the middle together. Separate the 2 pieces of paper and cut half a heart with scissors into 1, but don't cut it ALL the way around, leave a small part uncut so that the heart DOES NOT come apart from the rest of the card. Open the card and fold a crease in the heart the opposite direction of the crease you already made. This 3rd piece of paper is optional, this will totes work with omitting this step! Cut a piece of different colored paper (or patterned paper, because we love pattern! 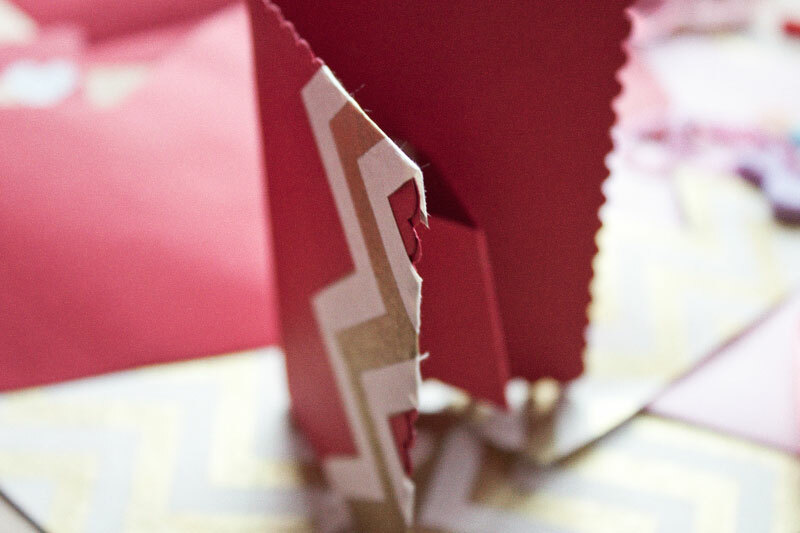 ), fold it down the center around the backside of the paper with the heart cut out and glue stick it into place. Fold the already scored piece of paper you started with around the one with the heart cut out and adhere into place with a glue stick. Lots 'o cutting and gluing, isn't that what crafting is about?! And there we have it, a pop up heart card. I added a little but of the chevron patterned paper to the front to finish it off, but you could finish it with stamps, or sticker, or whatever makes you happy! 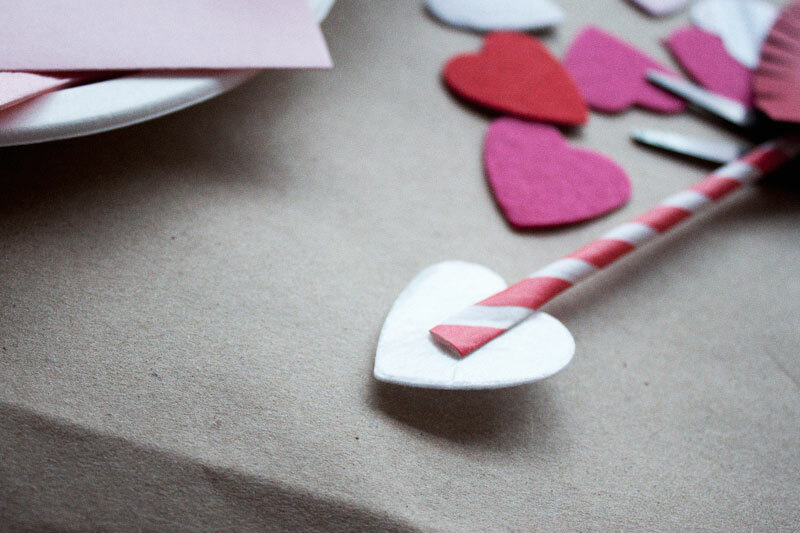 How about a heart shaped arrow to throw at your one true love (don't worry, it won't hurt!). 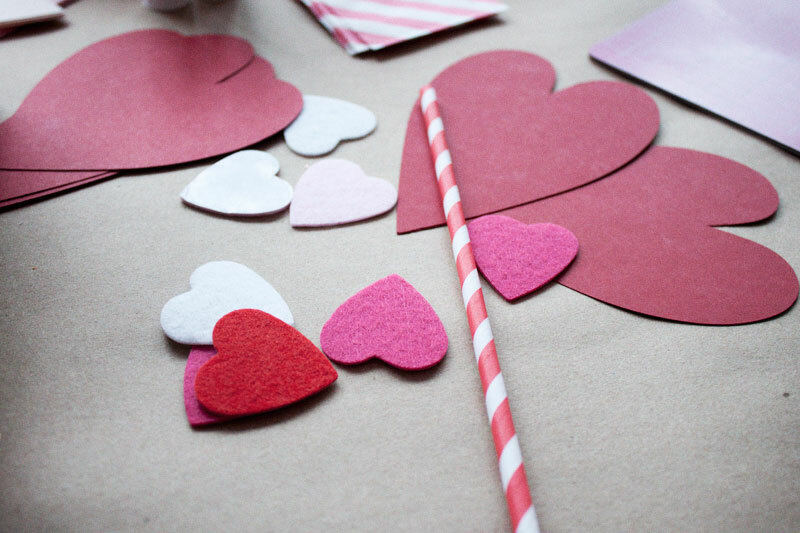 Gather together a strong paper straw, red construction paper hearts and small felt hearts. Cut two slits in the heart and cut a bunch of slits along the edge to make-it-nicey. Pinch about half an inch on each end of the straw an inch flat. AND YOU'RE DONE! Toss it someones way to tell them you love them, everyone likes to be told they are loved! There were also some adorable striped treat bags and conversation hearts on the table, so I decided to give something else a go. Glue the treat bag down to a piece of colored construction paper, leaving the top inch free from the glue. Fill the treat bag with conversation hearts. 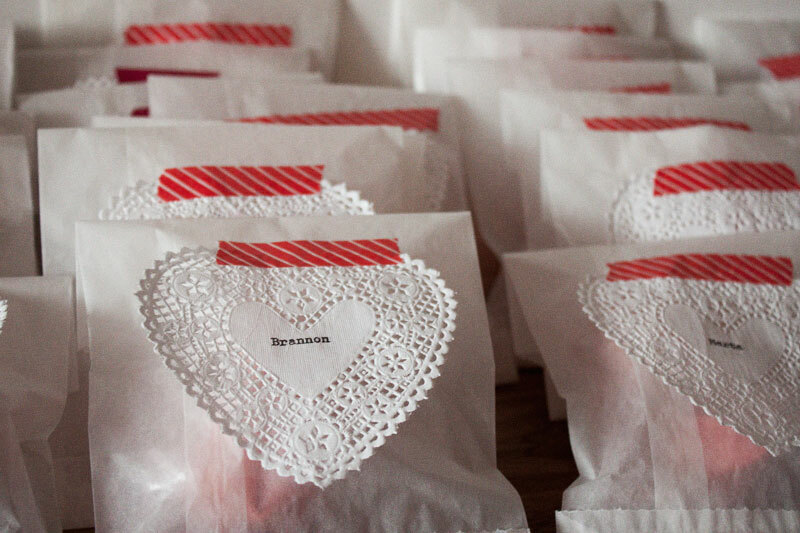 Fold the treat bag over and close with a heart sticker. Add a little note to the top and you have an incredibly easy, sweet treat to give to your honey! OK ONE MORE! Remember when you were a kid, and everyone mouthed "Olive Juice" across the room, and you got excited or laughed or hoped they were saying "I Love You". I DO! Trim down the treat bag to make the shape of a glass (of JUICE!) . Cut down a straw to fit. Glue your "glass" down to a heart cut out and add some heart bubbles to finish it off! OLIVE JUICE guys! Thanks to Design*Sponge for having us! How are you telling someone you love them this year? I love cupcakes & Pantone & pattern. At 128johnst. we like to get our hands dirty. © Jamie Silver 2019 All rights reserved. No images may be used without permission.